Karimunjawa Island is a tropical paradise about a 2 hour boat ride north of Java. Or it’s supposed to be if you look on Google. Unfortunately when I arrived it was during a monsoon, and most days were spent sheltering from the torrential rain, thunder and lightening. There’s a lot of activities available on the island. The usual snorkelling, diving, kayaking, paddle boarding, and scooter tours are being advertised by most hostels. One morning I woke up to a fraction of blue sky and decided to book on to the snorkelling tour. You get a few hours snorkelling in the morning, lunch and a chance to explore an island, then more snorkelling before heading to another island to watch sunset. 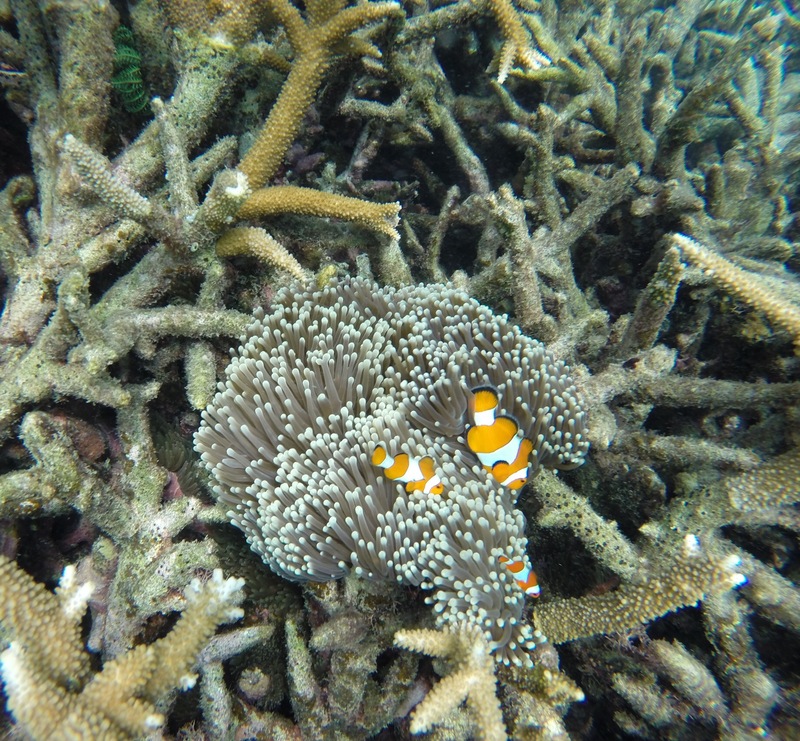 The conditions for snorkelling were some of the best I have experienced. Colourful marine life, different coral, a few turtles and even a small shark were all spotted. The lunch consists of fresh fish (basically what you have just been swimming with 😬), rice and some veg. Unfortunately we didn’t see a sunset as the rain and wind had picked up again and we were all frozen on the boat so just headed home. The beaches on Karimunjawa itself aren’t really that great. To get to them you would need to hire a scooter, and most have entrance fees which go towards cleaning the beach (considering how much litter there was, I don’t think so). 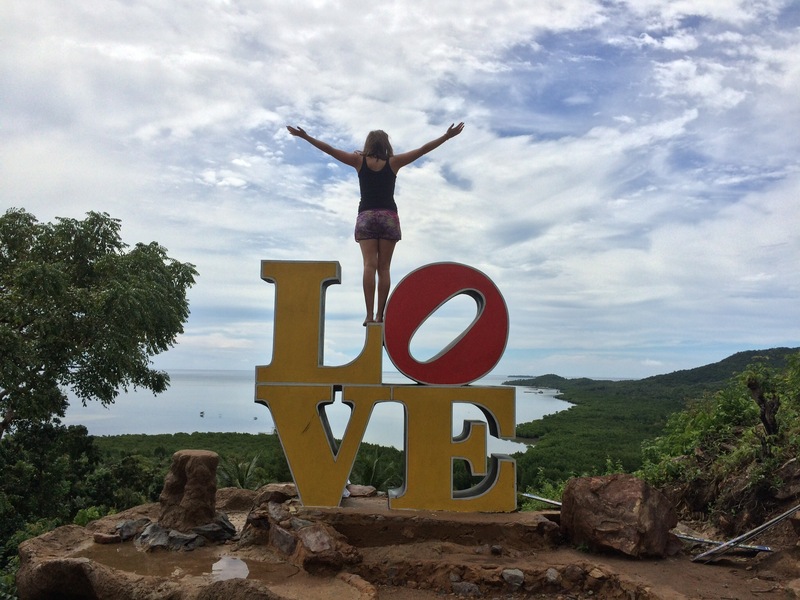 There’s a cool viewpoint called Bukit Love which has a great view out over the ocean. This is another good spot for sunset. To get on and off the island is relatively easy, as long as you research beforehand. You could go by boat or plane, but only on certain days and from certain places. I would recommend the plane if it’s not fully booked. It’s the tiniest little thing, only 15 seats and you can’t stand up in it. But you can see everything the pilots do which is cool. I stayed at a place called Happinezz. The bedrooms are basic, but all you need. There’s a big social area and the owners, Joyce and Sudar, are great. Nothing is too much trouble and they will help you with onward travel plans. If you’re lucky Joyce will make you some Poffertjes! I had heard many great things about Kerala. 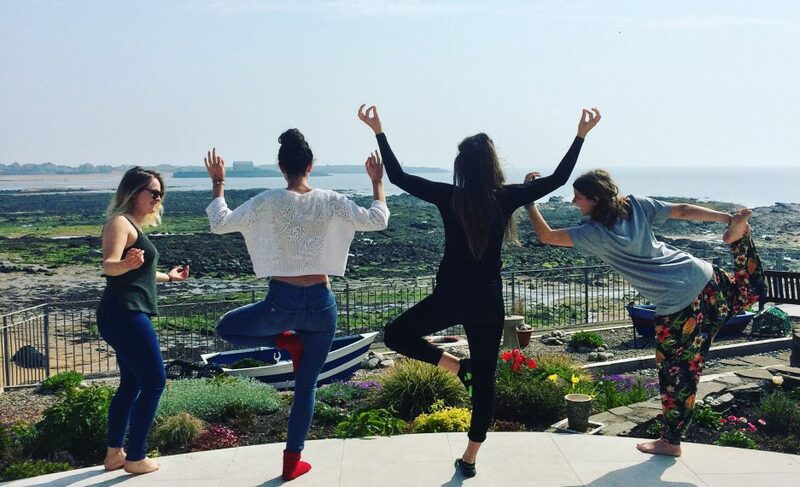 Countryside, beaches and great food were awaiting us. Our first stop was in Kalpetta. The very bumpy bus journey from Msyore took you through national parks and passed locals on the roadside going about their day to day business. The bus cost 136 rupees (approx £1.50) and took 4 hours. On arrival in Kalpetta the lack of tourists was immediately evident. There weren’t any western restaurants, no stalls selling tack and few people spoke English. We arranged a day trip for the next day, involving climbing Chembra Peak and visiting Soochipara Waterfall. To trek to Chembra Peak costed 500 rupees each. This includes entrance fee and guide fee. The walk up Chembra Peak started off very easy, giving false hope for the rest of the climb. The uphill started and it didn’t stop, and blazing sun to this and the result was three exhausted girls. It’s a fairly busy route with many locals asking for photos along the way. 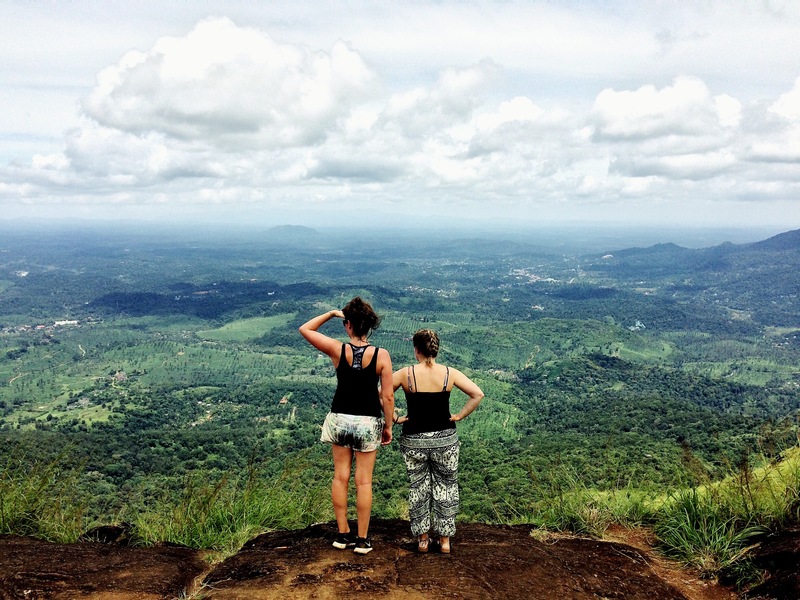 From the top you could see for miles over Kalpetta and the surrounding tea plantations. Soochipara Waterfall is pretty impressive. Many locals were swimming. As we are females we would have had to swim fully clothed and we didn’t really fancy spending the rest of our day in damp clothes. From Kalpetta we took a bus to Calicut. This is one of the most impressive bus journeys I have ever been on. The buildings soon stopped and for miles all you could see were rolling green hills. The road is very windy with hairpin bends at every corner. This bus took 2 hours and cost 52 rupees. We were advised to go to Calicut by the staff in our Kalpetta hotel. This town is even less touristy than Kaleptta. We were looking forward to a couple of days relaxing on the beach and swimming in the ocean. Our hopes were soon dashed as driving through the town it was clear to see that nobody swam in the sea and everybody was fully clothed. That night we headed to the beach to watch the sunset. I have never seen so many people in such a small place! It was absolutely packed. And what space wasn’t being used by people, was filled up with rubbish. Bottles, bags, food wrappers, you name it. It was filthy and we couldn’t wait to get off. We decided to leave Calicut as soon as possible so as to not waste any more time there. 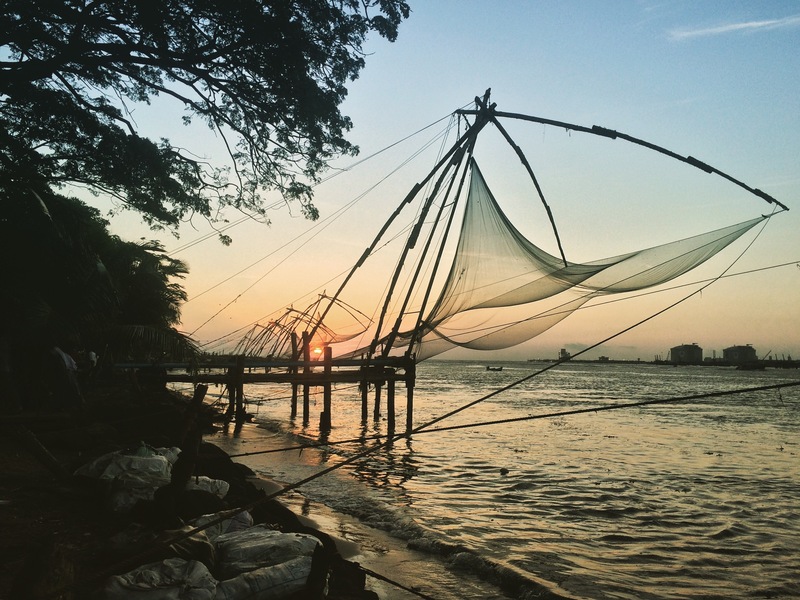 We took the morning train to Kochi, taking 5 hours and costing 75 rupees. Those trains are like moving saunas! We stayed in a great guesthouse called Green Woods Bethlehem, Fort Kochi. The owners are absolutely great and will help you with any plans or problems. 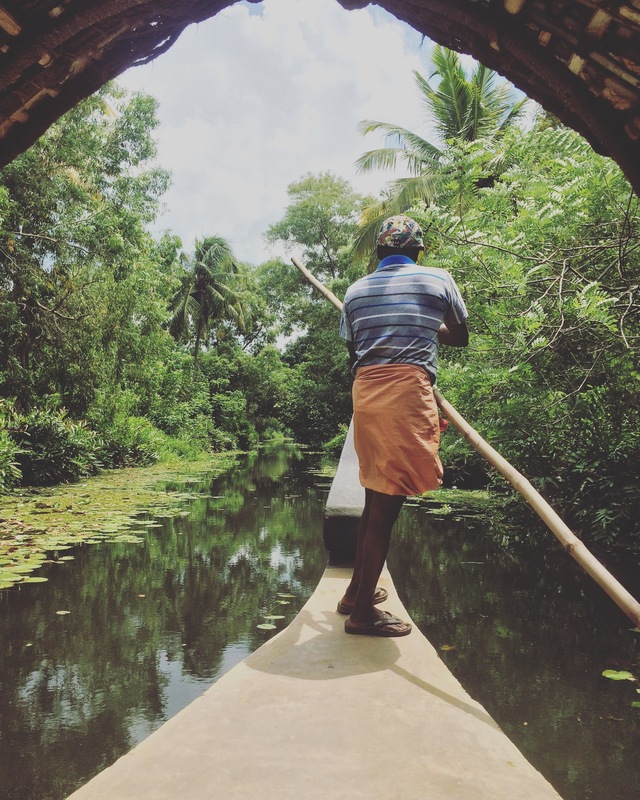 The backwaters were often mentioned by other backpackers and we arranged to do a day tour. The scenery is nice, and the journey is relaxing, but you move along so slowly and I personally found it really quite boring. One hour would have been enough for me! 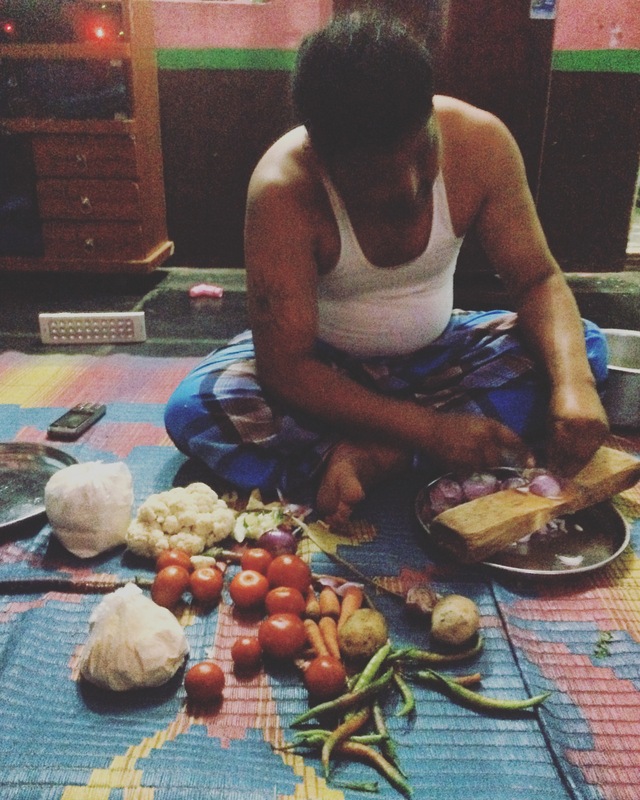 Sheeba, the owner of the guesthouse, runs cooking demonstrations at night. I’ve never seen somebody prepare and cook so many different dishes in such a short space of time, she was very impressive and the food was great. To get to Hampi from Goa, you can either take a bus or a train. We settled for a night bus. The bus was due to leave Canacona at 8pm (the nearest stop to Palolem) and arrive in to Hampi at 5am. This cost 900 rupees (approx £10) for a sleeper AC bus. The ‘stop’ at Canacona was actually just a bench under a tree by the side of the road. Dogs, cows, cockroaches and crickets were there to keep you company. The crazy driving combined with terrible road conditions made for a pretty awful journey. 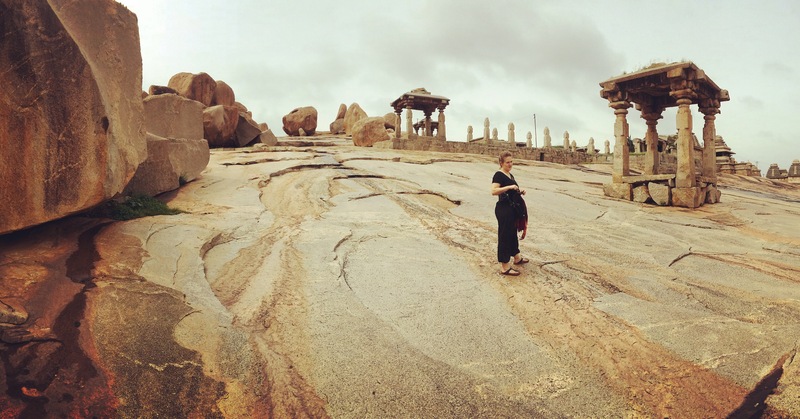 Thankfully sleep eventually took over and we arrived in Hampi. We took a tuk tuk to Gopi Guesthouse. A fan room for 3 people cost us 800 rupees. Hampi is a total tourist trap and this seems to be the main source of income. Tour guides, tuk tuk drivers, stall owners and restaurant staff will be constantly at you when you are walking down the streets. The landscape isn’t like anything I have ever seen before. There are massive boulders somehow balanced on top of more boulders as far as the eye can see. This is purely down to erosion, but it is so incredible that I can’t quite believe that only nature has done this. There are also monuments everywhere. Over 500 in fact. Ruins of temples, palaces, baths, markets and many others surprise you at every turn. 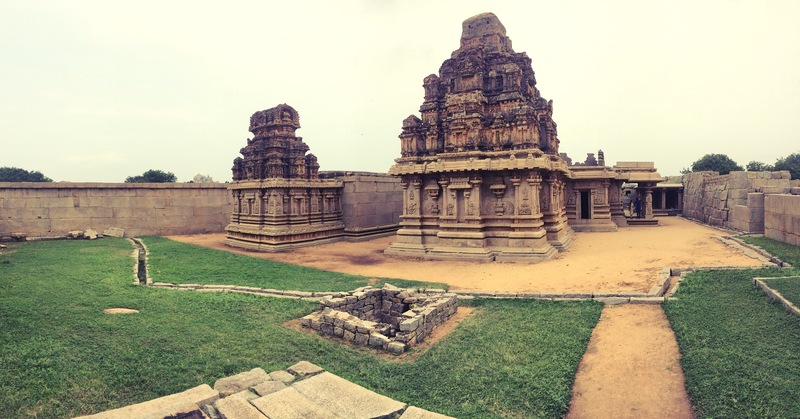 Hampi is a bit of an open air museum. Everything is spread over a small distance which is easy to cover in a tuk tuk. A full day tour cost us 1,500 rupees. If you are feeling a bit more active and can handle the sweltering sun, there are many stalls offering bicycle rental. A cooking class with a local family is a good alternative activity after a day of temple bashing. We paid 500 rupees each to make 3 different curries, pakoras, naan and chapati. Learning how to make curry the traditional way was really interesting, although I wish I didn’t know how much oil went in one curry (about 3 tablespoons!). 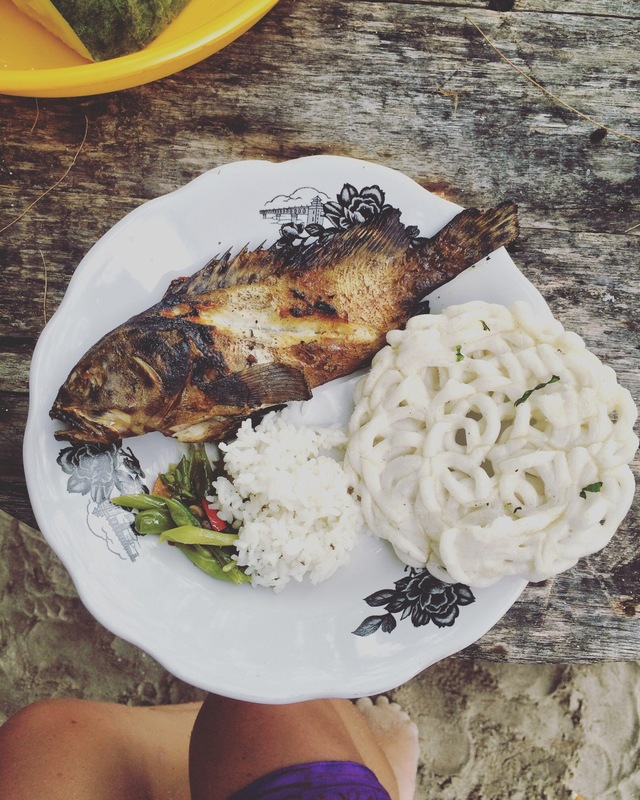 There are many guesthouses and restaurants offering delicious food. Hampi is a vegetarian town. The veggie food is very good here, with so many options. Most places will sell a variety of Asian cuisines as well as a couple of western options. Heading back to a city was a bit daunting after almost two weeks in more relaxed and quieter areas. The overnight train from Hospet (the nearest station to Hampi) to Mysore cost 1,300 rupees (approx £15) in 3 tier sleeper AC class. This was much more comfortable than the bus and getting a good nights sleep was no issue. Our accommodation was a basic hostel, Sonder Hostel, costing 500 rupees per night per person in an AC dorm. The location was pretty good and we were close to a few nice restaurants. As we arrived before check in, we headed out for some breakfast. We were recommended to go to Green Leaf, just a five minute walk away. This was the first time on my trip where the food hasn’t been great at all. Maybe we ordered the wrong things, but I wouldn’t recommend it. The first stop on our brief visit to Mysore was to the main attraction, Mysore Palace. The ticket and entrance system is very disorganised with many different stops for different things, eg leaving cameras, removing footwear and bag checks. The entrance fee is 200 rupees and this includes an audio guide for foreigners. The Palace itself is really beautiful with intricate detail and design. The different rooms all decorated with bright blue and gold pillars and archways really catches your eye. No photos are allowed inside the Palace which is a bit frustrating. We made a stop at St Philomena’s Catholic Church, one of the tallest churches in Asia. Unfortunately we couldn’t really see inside as there was a lot of construction work going on. We were shown down a stairway which led to corridors running under the church which was pretty cool. For tea we ate at The Sixth Hotel. The food here was so cheap- only 100 rupees for curry and rice. 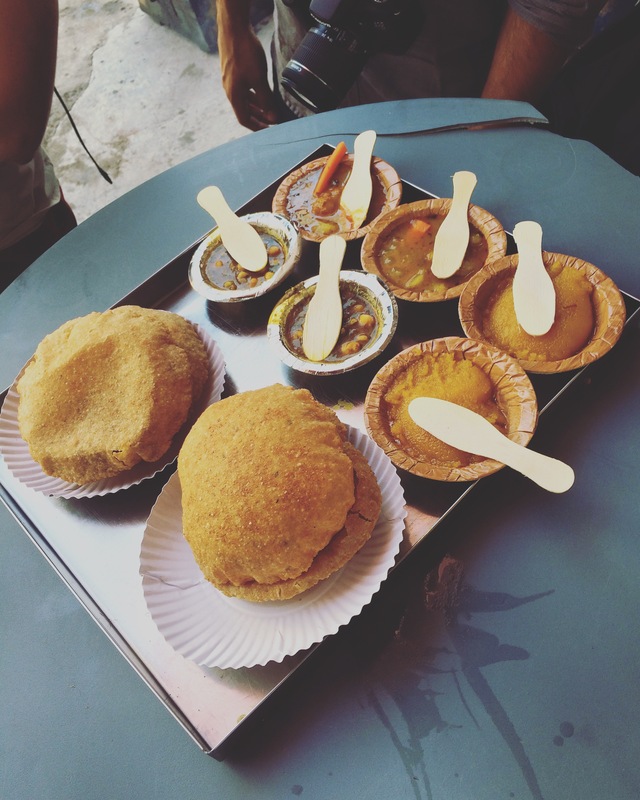 Everything was really tasty and I would definitely recommend it for budget travellers. Before getting the bus to our next stop, we ventured in to the market. Spices, fruit, vegetables and body paint all line the sides of the streets. The vibrant colours, fresh smells and volume of people give the market a great energy. Most stalls open at about 9am. 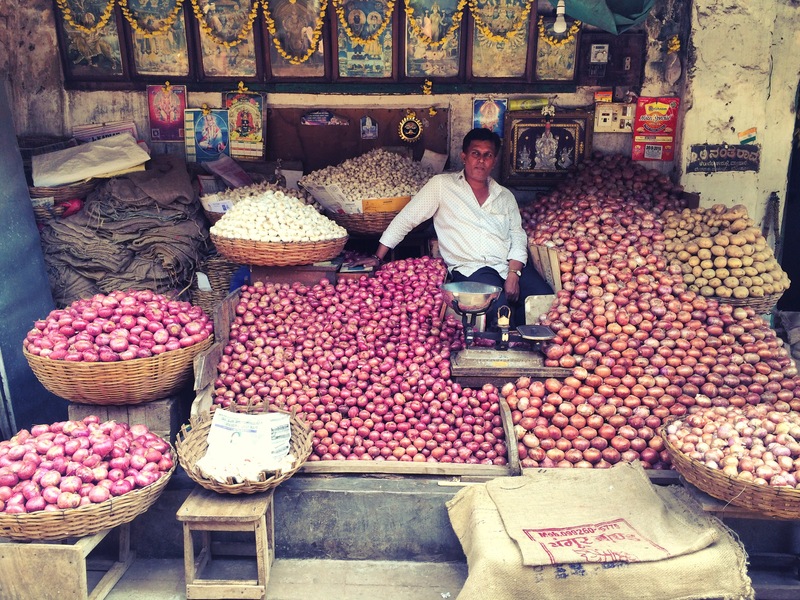 Mysore isn’t as hectic as the bigger cities and people aren’t as pushy for your business. When I thought of Goa the images that came to mind were of white sand beaches, crystal clear blue waters, sunshine and, of course, cows. Lots of cows. Unfortunately when I was in Goa, only one of the above was correct. The cows. It’s always a risk travelling in monsoon season, and this time the risk did not pay off. Even though monsoon season usually ends at the end of August, this year was an exception, and the rain continued through September. 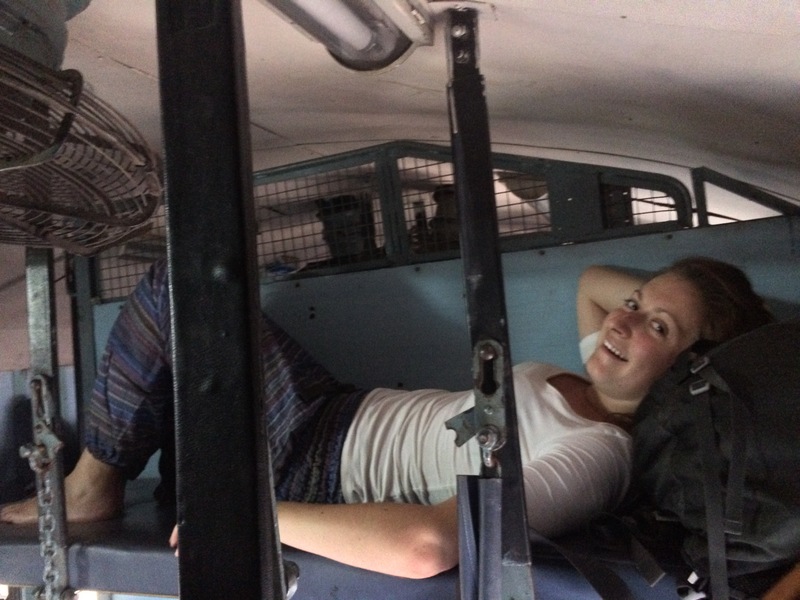 I flew from Mumbai to Goa as I didn’t fancy a 15 hour overnight train journey on my own. Getting from the airport to anywhere in Goa is relatively simple. There are taxis, buses and rickshaws all desperate to win your business. I decided to start my trip in Panjim, the capital of Goa. I took the bus from the airport to Vasco Market which cost 10 rupees (approx 10p) and from Vasco Market I took another bus to Panjim bus station and this cost 40 rupees. The buses are very basic and usually cramped, but it’s the cheapest way to get from A – B.
I was staying in The Old Quarter Hostel run by the The Hostel Crowd. This is a chain of hostels run by a group of young guys who are very in touch with the backpacking scene. There is a great common area and also a little cafe selling homemade cakes and juices. Rooms are pretty cheap, on average it will cost you 500 rupees per night for an AC ensuite dorm, with breakfast. 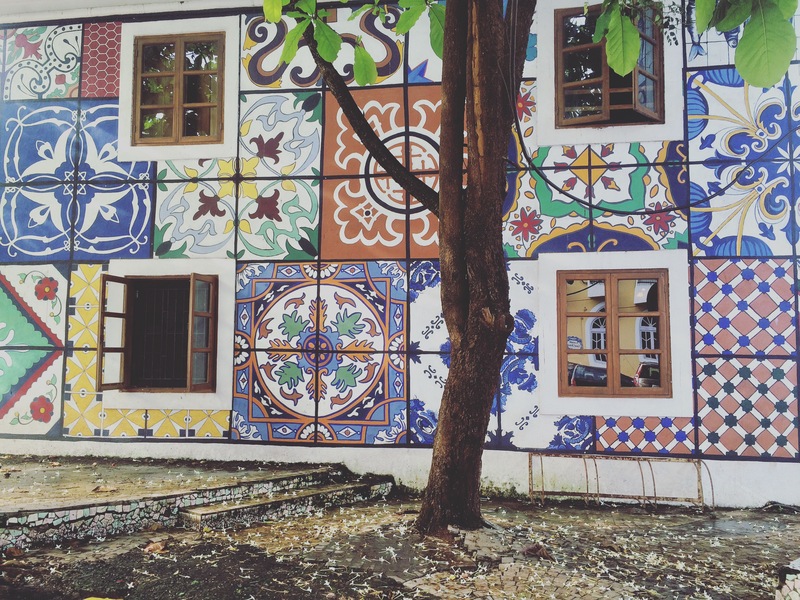 Panjim is a really colourful town with a lot of Portuguese influence. There are churches, cathedrals and temples dotted around the town. A short bus journey to Old Goa (10 rupees each way) will take you to an area with a lot of history and culture. You could spend an afternoon wandering the streets here. There are many little restaurants to choose from, but I went for Viva Panjim. Hidden up a little back street, this family run restaurant offers traditional Goan food. Goan food reminds me of Thai food as quite often coconut flavours are used. 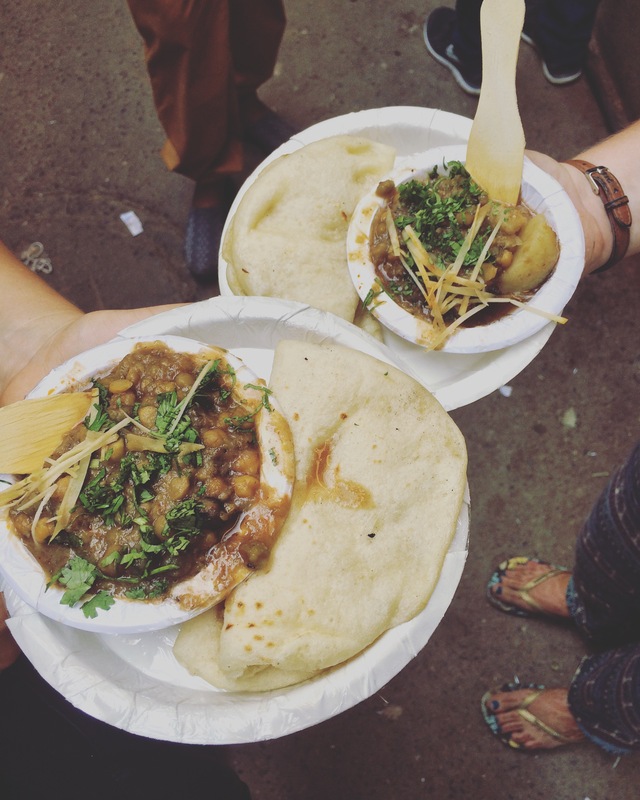 For curry and chapati you can expect to pay 200 – 300 rupees. 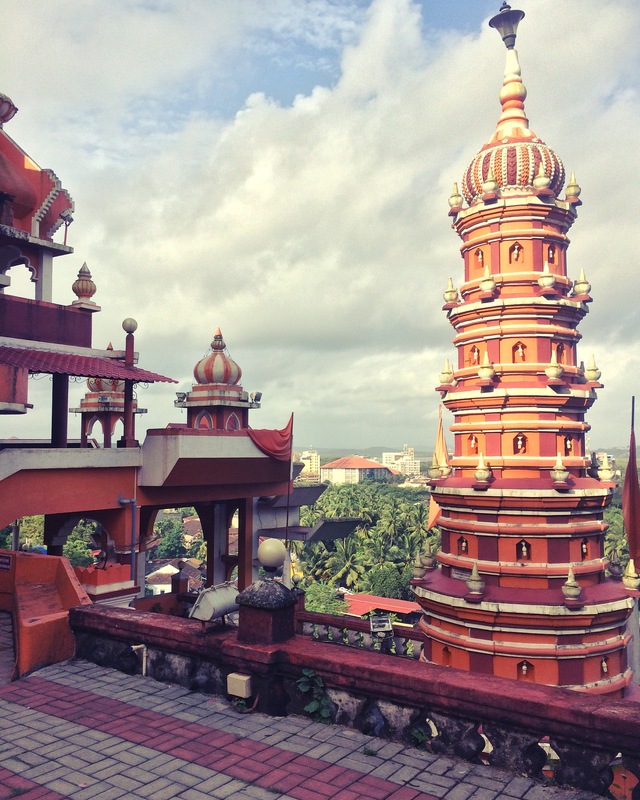 Goa has many beaches, the north tending to be busier and more of a party scene, and the south being more laid back. In true granny style I decided to head for the quiet beach in south Goa called Palolem. The Hostel Crowd also have a hostel here called Summer Hostel. Buses run to Palolem from Panjim, with a change in Margoa. This will cost you 50 rupees. On arrival I was lucky to have a few hours of sunshine and witnessed the paradise I was imagining. And then the rain started, and it never stopped. When you’re at the beach in the rain there really isn’t much you can do. Most of my time was spent reading books in my favourite beachside spot, Cafe del Mar. The main road to the beach is lined with stalls, guesthouses, cafes and restaurants. There is a great mixture of cuisine here and everyday fresh seafood is available. A curry and naan costs roughly 300 rupees. The seafood is very cheap, for example 15 tiger prawns, chips and salad costs 300 rupees! Most places serve all different kinds of Asian food, but if you feel you need a break there is a great Italian called Magic Italy. This restaurant is run by an Italian family and imports ham, cheese and pasta from Italy. Although it is a bit more expensive at about 500 rupees for a pizza and a beer, it is definitely worth it. 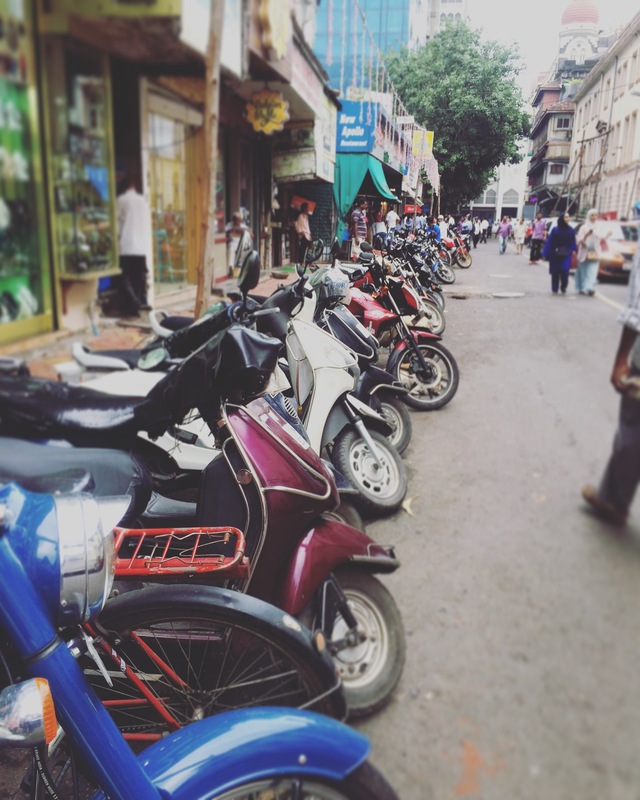 Scooters are readily available to hire, from as little as 250 rupees a day (plus petrol). 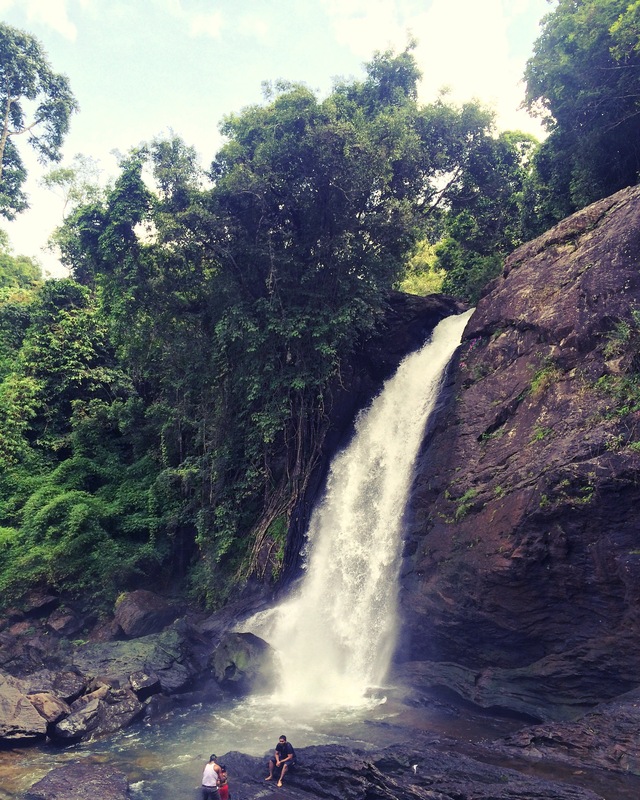 There are many beaches and waterfalls in driving distance of Palolem. Unfortunately due to a scooter accident in Bali last year (I managed to drive straight in to a wall…) I am now officially banned from using them. I’ll need to get lessons at home as using a scooter is one of the easiest and cheapest ways to navigate yourself around Asia. Mumbai, India’s mega city, where no space is left empty. 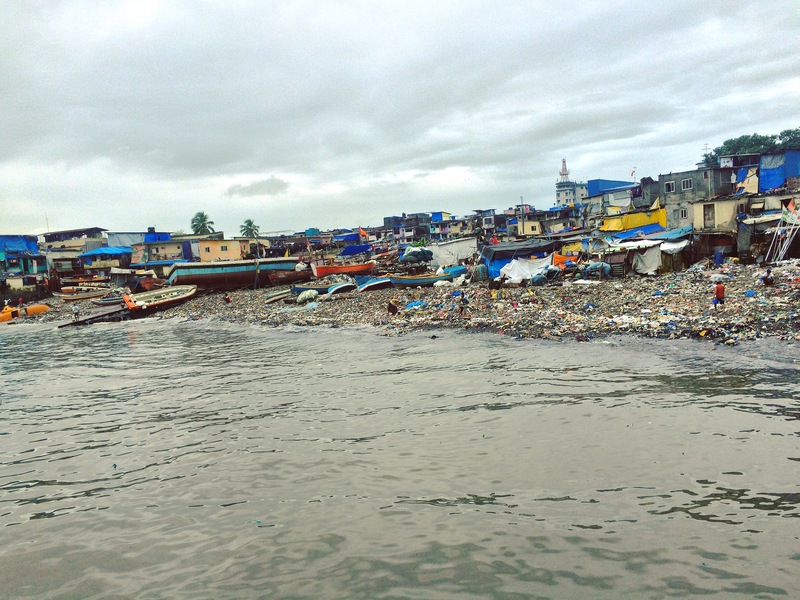 The city has an impressive skyline of skyscrapers, with slums squashed in between. Mumbai has the largest number of millionaires and billionaires in India, but the dramatic difference between rich and poor is very obvious as people park their brand new Mercedes next to a mother and child begging for food. Being in Mumbai is very intense. It is such an enormous place, it would take forever to see everything. There are countless museums, art galleries, noteworthy buildings and statues, traditional cinemas and restaurants, and even a coastline to try and see. As well as this, there are of course the markets which seem to pop up everywhere all over India. If you have a short time, it’s better to choose the things you really want to see and take your time, rather than rushing around everywhere. 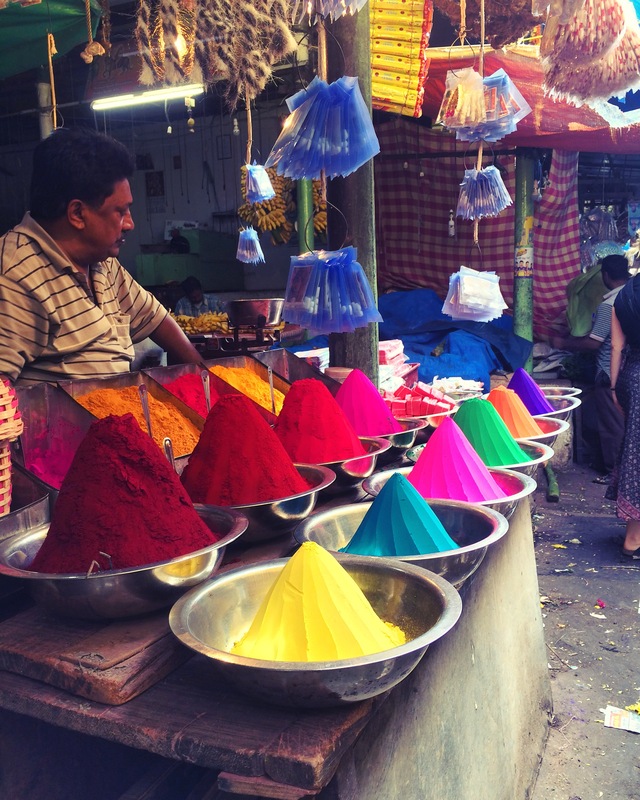 Staying in the Colaba area gives you a good base to see many different things. As the roads are so busy with bumper to bumper traffic, it’s more efficient to walk short distances. 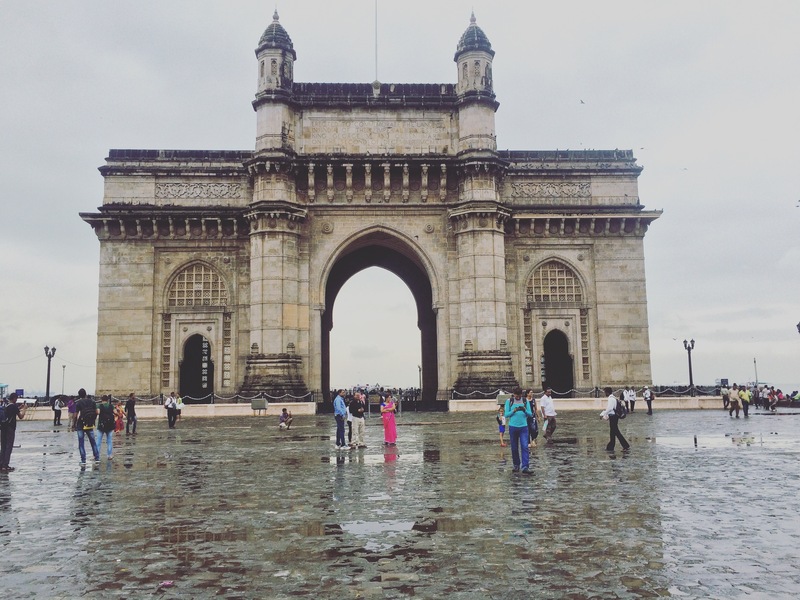 Here you will find the Gateway to India, Mumbai University, The Prince of Wales Museum, The Taj Mahal Palace Hotel, Regal Cinema and Leopold Cafe to name a few. As this area was attacked a few years back, don’t be surprised to be searched by security upon entering certain places. Mumbai is a city where you could spend a lot of time and never get bored. It seems to be constantly changing with new things to see and do appearing quite frequently. The first thing I noticed upon arrival in Jaipur is just how friendly the locals are. They are all desperate to say hello and find out where you are from. A pleasant surprise after being in Agra. The roads and driving were potentially the worst I had seen in India so far. It seems to be the norm to dodge chickens, dogs, goats, cows, camels and even elephants whilst driving. The train from Agra to Jaipur took 7 hours and cost us 240 rupees (approx £2.70). We were on the third bunk up with our knees just about touching the ceiling fans. Being on the highest bunk means you get the whole bench to yourself as everybody else sits on the lower bunks. There were some older ladies and gents in our booth below us who we soon adopted as our Indian grandparents. They insisted we ate every unidentifiable snack they handed up to us, and of course we obliged. Our hotel, Umaid Bhawan, is an old heritage building with traditional Indian decor. It’s really striking and stands out on the street (which helps when it’s 9pm, dark, and your tuk tuk driver doesn’t really know where he is going). Although it is a bit out of town, it is definitely worth staying here. The area is a bit quieter (going by Indian standards) and it’s really cheap to get in and out of the centre. 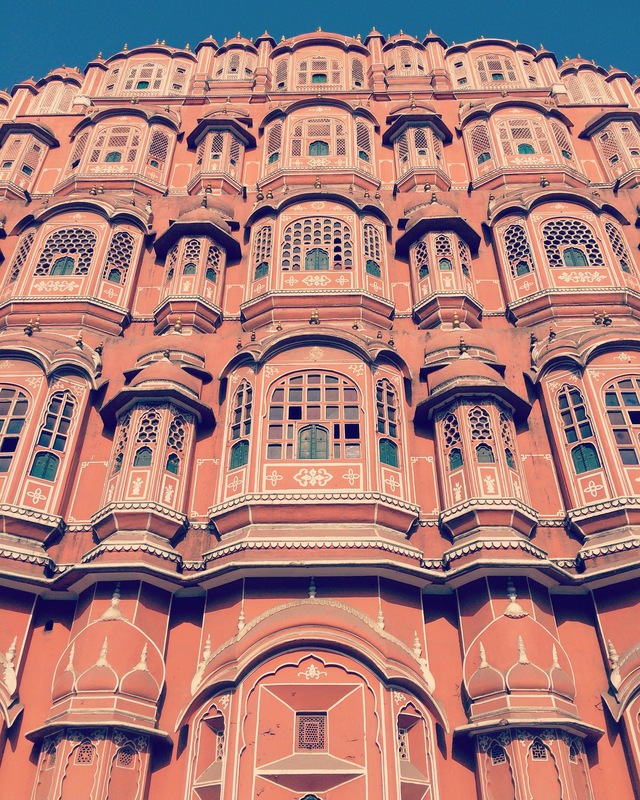 There are many sights to see in Jaipur, also known as the Pink City. It took on this name when the Prince of Wales and Queen Victoria visited in 1876 and the Maharaja had the buildings in the centre painted pink, as the colour pink symbolises hospitality. 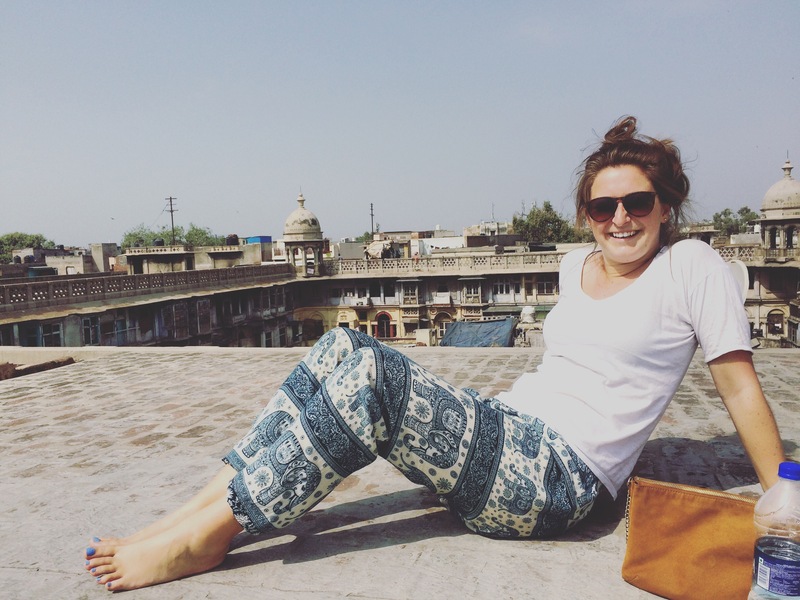 As we had such a short time in Jaipur we researched doing a walking tour. We came across freetours.com which, as the name suggests, are a free tour company (although they do expect to be tipped). Check their website out as they run tours all over the world. Our guide, Hussey, was a local from Jaipur who had followed his dream of becoming a tour guide. 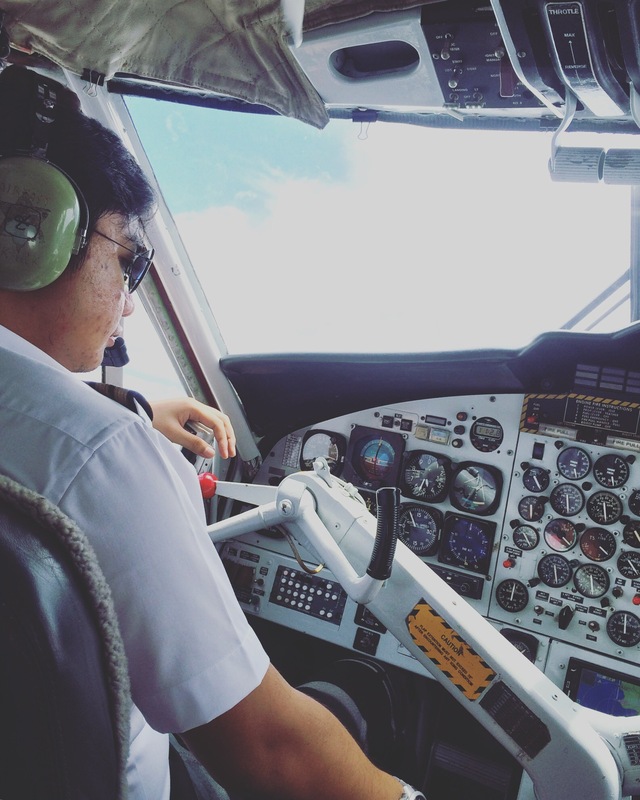 His parents had pushed him in to studying law and working in his uncle’s firm, but after his uncle passed away he changed his career and has been doing tours for two years. He’s really knowledgeable and very friendly. He knows the city inside out and took us to many big and small attractions in the two hours we had with him. The meeting point was just outside Hawa Mahal, also knows as Wind Palace, or the Honeycomb Palace. Back in the day, ladies would sit up high looking out of the windows and watching the market, whilst remaining out of the public eye. We timed our visit to the City Palace well as on arrival we were greeted by the sound of locals singing. 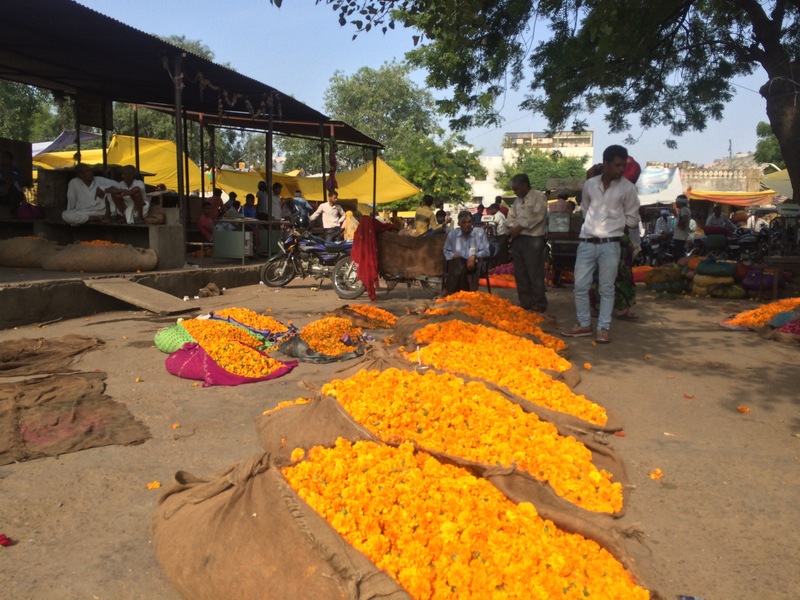 Locals in their hundreds had flocked to the City Palace and were giving their offering to the gods. The energy coming out of the room was incredible, everyone was so into it without a care in the world. Singing, dancing and clapping are the norm. Walking through the streets you will stumble across markets, whether you plan to or not. To us, these markets seem like absolute chaos. Men and women sat on the street selling whatever has come from their land that morning. 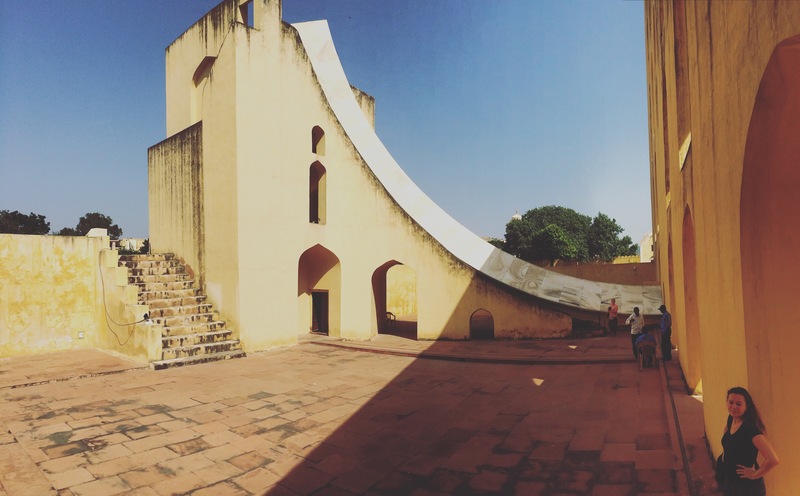 Jantar Mantar, which roughly translates to ‘formulating instruments’, is a sectioned off area in Jaipur where there are many different instruments used to tell the time and horoscopes, all from the position of the sun. This is something completely different so if you are needing a break from temples and palaces, head here. I would recommend going with somebody who knows what all the different structures do, otherwise you will walk around aimlessly, but still in awe. Amber Fort is a huge fort which sits on a hilltop high above Amer, just outside of Jaipur. 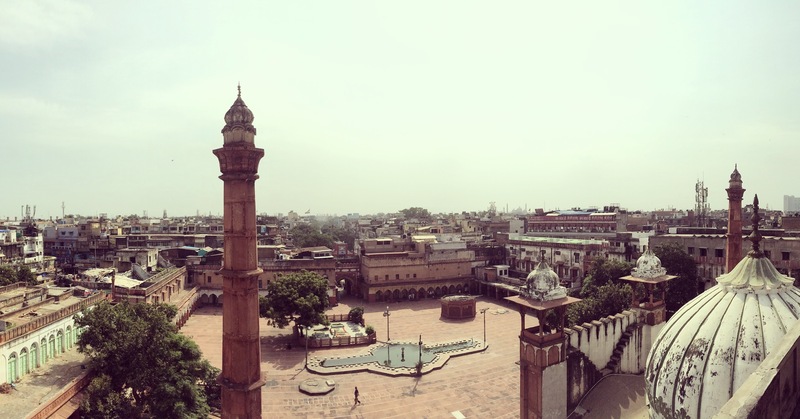 This used to be the capital of Rajasthan, until the King moved it to Jaipur. The fort is a real maze with many different levels and rooms. The entrance fee is 500 rupees (approx £5.60). 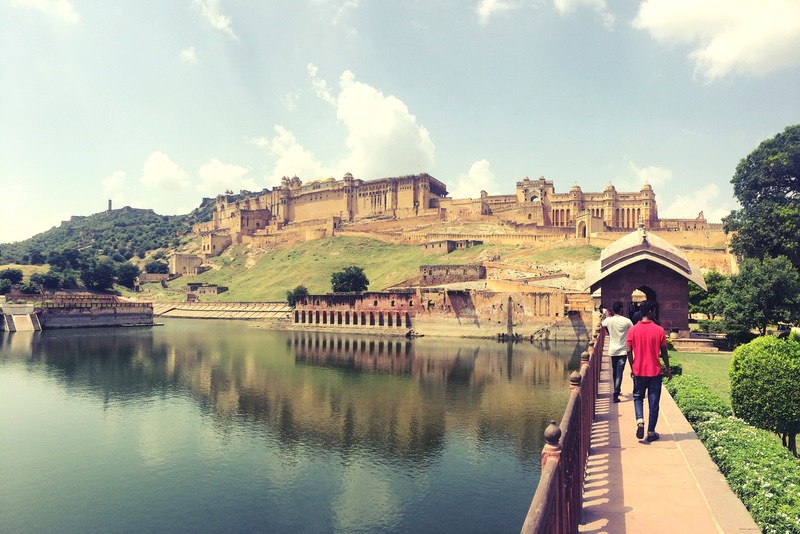 The only downside about being in Amber Fort was the amount of locals asking for a photo. If I had a rupee for every time I was asked for ‘just one photo mam’ I would have nearly made my entrance fee back! The Jal Mahal, also known as the Water Palace, is, as the name suggests, surrounded by water. It’s not the most interesting palace as you can’t get a good look at it. Earlier in the day when we were on our tour with Hussey, he had dropped into conversation that his family have elephants. We gave him a call and asked if we could see them. He was more than happy for us to visit and actually sent a driver to pick us up. 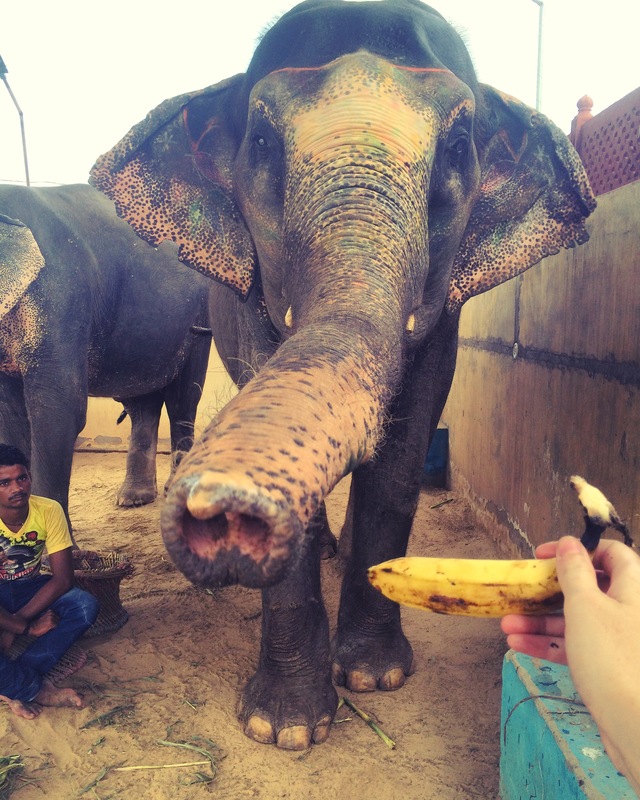 There was no entrance fee or scam, all we had to do was buy bananas to feed the two elephants. Hussey’s great grandparents used to ride elephants in the procession for the King, but when India gained independence and there was no more King, he gifted them the elephants. Ever since they have had elephants, either through breeding, or from rescuing them from the circus. There were no chains or sticks, just a nice paddock. The elephants were so calm and obeyed voice commands from Hussey and his cousins. They were delighted with the bananas and made short work of them. For sunset we headed to Nahargarh Fort, also knows as Tiger Fort. You pay a 200 rupee (approx £2.25) entrance fee. If you go to Padao Restaurant you are offered a complimentary drink. The view from the roof of Padao restaurant is breathtaking. You don’t quite realise how big a city is until you are above it. 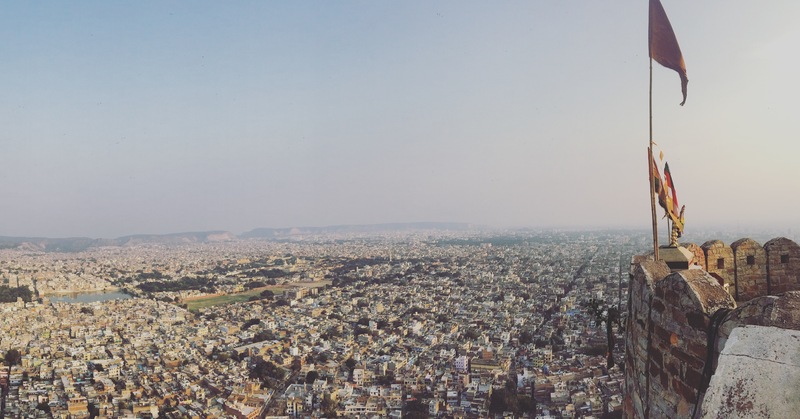 Jaipur stretched below us in all directions as far as the eye could see. To finish off our day we headed to Surabhi Restaurant (& Turban Museum). The food was the best we have had so far on our trip. The service and cultural performance were a bit intense after such a tiring day, but if you are in to that kind of thing and have the energy then I’m sure it’s great. 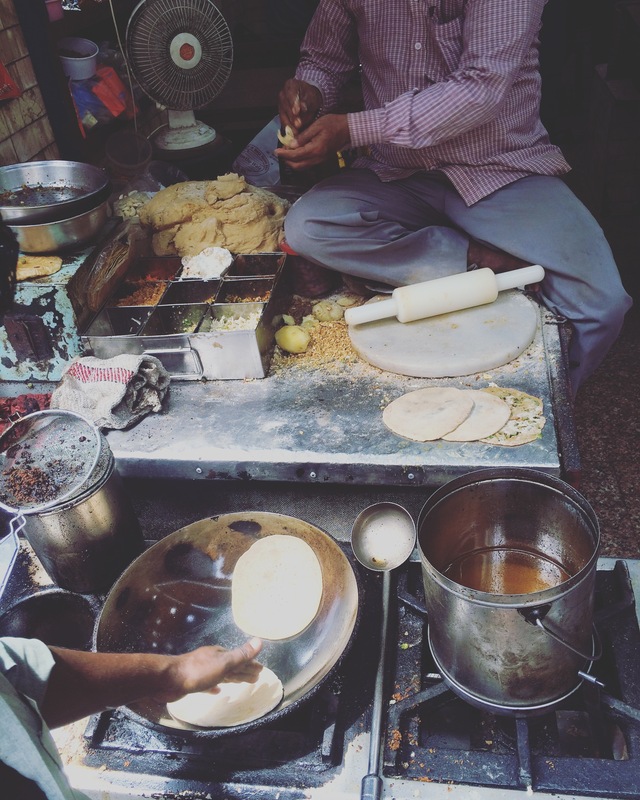 Jaipur has a lot to offer and I’m certain we haven’t even scraped the surface. Everyone has seen the photos and knows some of the history, but the Taj Mahal is truly a sight that needs to be seen with your own eyes. The sheer size of the off white marble mausoleum is breathtaking. No photo will do it justice. It is very easy to gain access to the Taj Mahal. There are ticket offices near each of the entrance gates. It is not necessary to book tickets online. For foreign travellers a ticket will set you back 1,000 rupees (approx £11), which includes a bottle of water and shoe covers. An electronic bus will take visitors from the ticket office to the gate. Make sure you are aware of what you can and can’t take in to the Taj Mahal as they are very strict about this (it is clearly detailed on signs in the ticket office and at the gate). 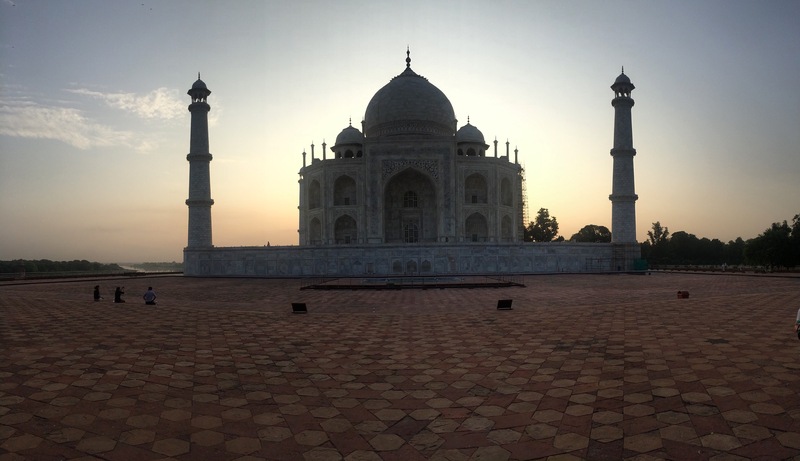 If you would like to visit the Taj Mahal at sunrise, make sure you enter via the east or west gate as the south gate does not open until 8am. Visiting at sunrise means you avoid the unbearable mid day heat and also the majority of the crowd. 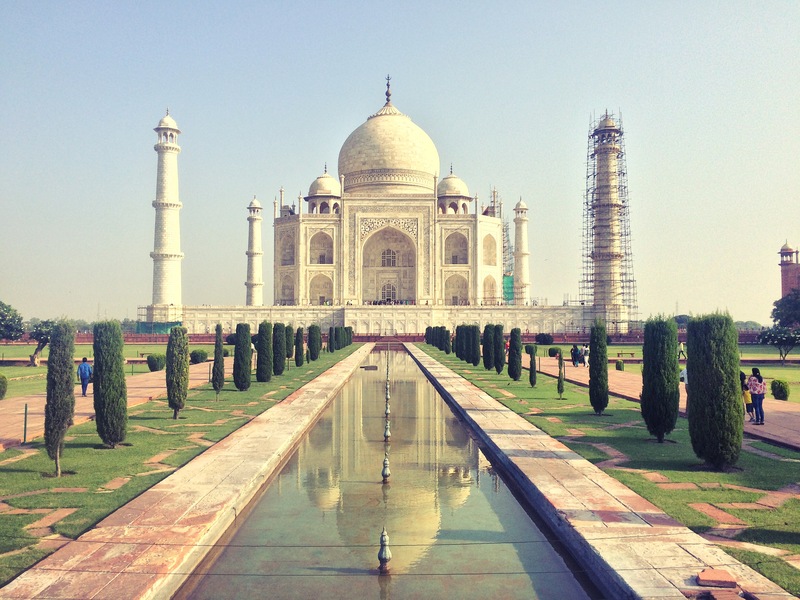 The Taj Mahal is one of the New7 Wonders of the World – and rightly so! 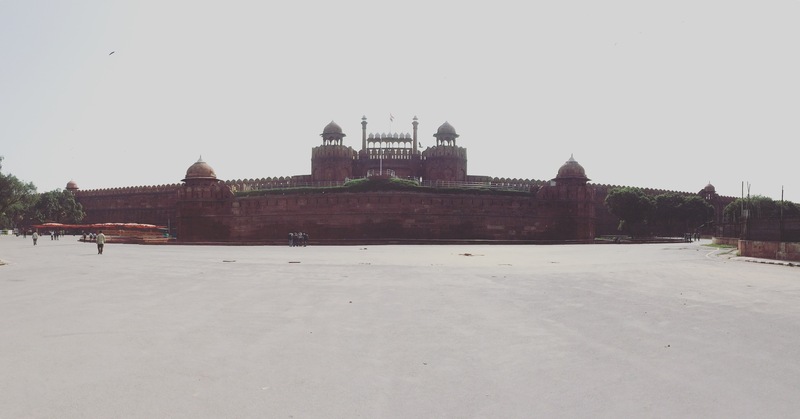 Surrounded by gardens and a sandstone fort, the symmetry of the Taj is extremely satisfying. From the huge domed roof, to the four slightly outward tilting minarets, and the reflection of the front of the mausoleum in the pools is really very impressive. 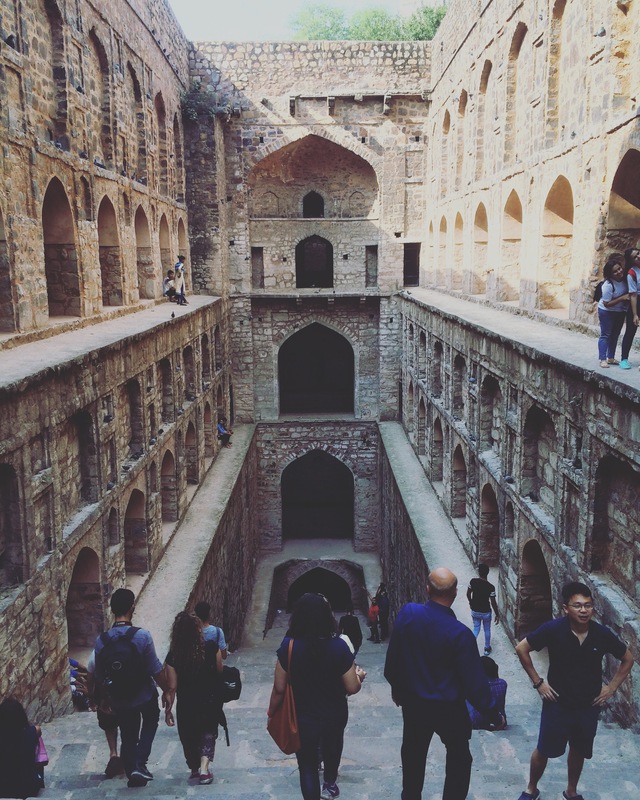 It’s amazing to think this grand structure was built by one of the Mughal emperors to house the tomb of his favourite wife. And then for him to be kept imprisoned in the much less stunning (in my opinion) Agra Fort, just a couple of kilometres further upstream on the Yamuna river, by his own son! Inside the grounds of the Taj Mahal the peace and tranquility is very calming. As soon as you cross the threshold to leave, the tuk tuk drivers and stall owners are on your back. They are extremely persistent and the sheer volume of people trying to get your attention is really quite unsettling. Having to say ‘no, thank you’ over and over again becomes tiresome very quickly. 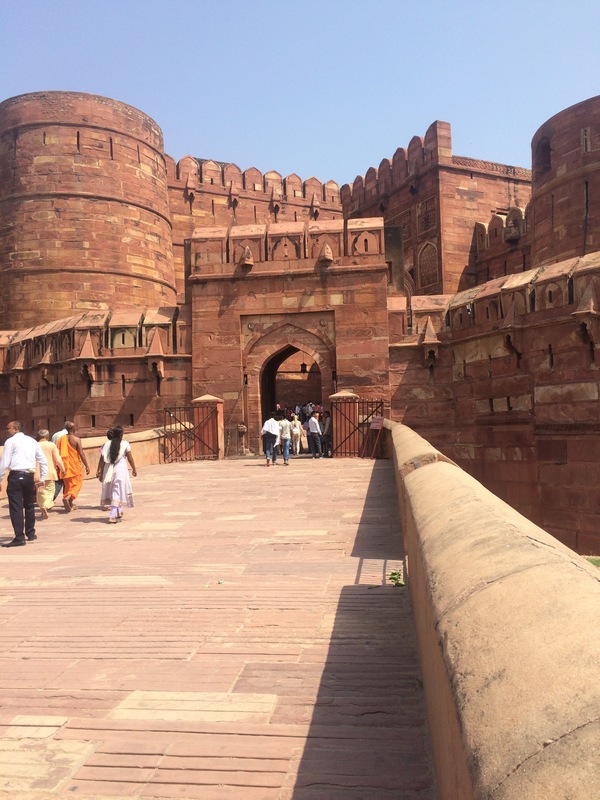 In my opinion, it is not worth staying in Agra. The city itself is extremely busy, chaotic and not very easy on the eye. It has been a bit of a challenge to find a good place to stay and nice restaurants to eat in. A day trip from Delhi is all you would need here. That is enough time to see the Taj Mahal and Agra Fort, as well as maybe another attraction if you wish. Trains run frequently enough, or you could take a private taxi if you have the funds. We missed the train we had hoped to catch from Delhi as the system for foreigners to buy train tickets is extremely long and a bit old fashioned. We ended up on the 11:25am train which cost us 170 rupees (approx £2). This was the cheapest option with no air con. We thought this would be manageable on such a short journey. Unfortunately, due to a passenger sitting at the open train door and crushing their feet between the moving train and platform, we were delayed by one hour. The journey should have taken two and a half hours, but ended up taking three and a half. There are many different options for trains – different durations and costs. I was greeted at Delhi airport by my friend Jen, who I had met travelling a couple of years ago. We took a taxi to our hostel, Madpackers. We were both pretty tired from travelling so we went out for some food and had a chilled night. The hostel is pretty modern and trendy. The rooms are big and spacious, and the common areas and kitchen are really well equipped. We signed up to do a tour of Delhi through the hostel. The tour is run by a local guy called Baddu, he’s so enthusiastic about Delhi, travel and food, so we got on great! We met up with everyone and walked the 5 minutes to the metro station. 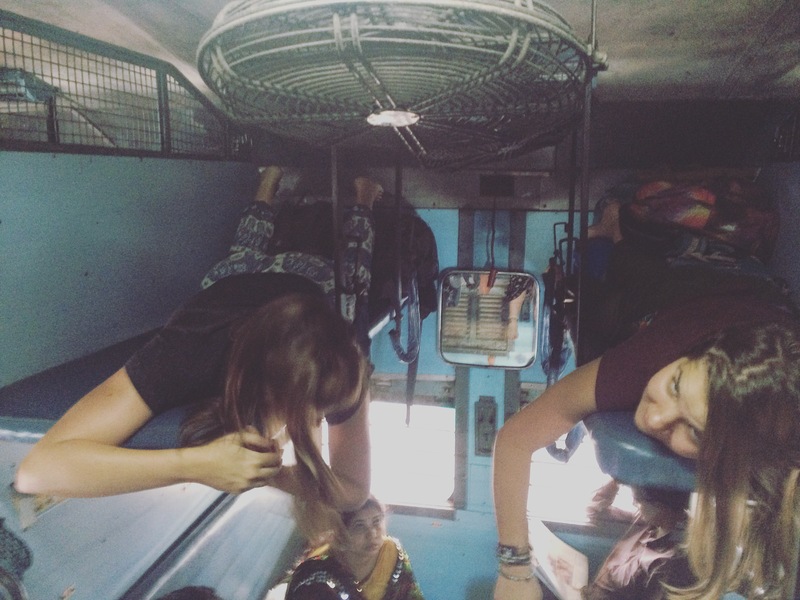 We took the metro to Chawri Bazar and were amazed to find it had air con! Even at 7am the temperature is rapidly rising. We took a tuk tuk and went straight to a little stall which is totally hidden in a rather uninviting back alley for breakfast. The only option you have is a mild chickpea dish, served with traditional bread. It is full of flavour, ginger, coriander, garam masala. You can choose your level of spice- low, medium and ‘at your own risk’. People travel from far and wide to have their breakfast here as this family run stall has held the unofficial title for best chole for many years. I don’t think many tourists would come across this place without the help of a local who knows their way around. We then headed out of the alley and across the street for breakfast number two. We ate at another little street food place, and had a plate full of different curries to try. Baddu then ordered us some sweet things, which to be honest I’m not too sure what they were. The one I tried kind of looked like a little yellow jelly tube but it had a really strange texture and I wasn’t a huge fan. After fuelling up on local delicacies, we took a rickshaw to the Red Fort. We didn’t go in but Baddu gave us a brief history on the place. It wasn’t the most breathtaking temple but it was pretty cool to see it and learn some of the history. The next part of the tour was actually my favourite part of the day. 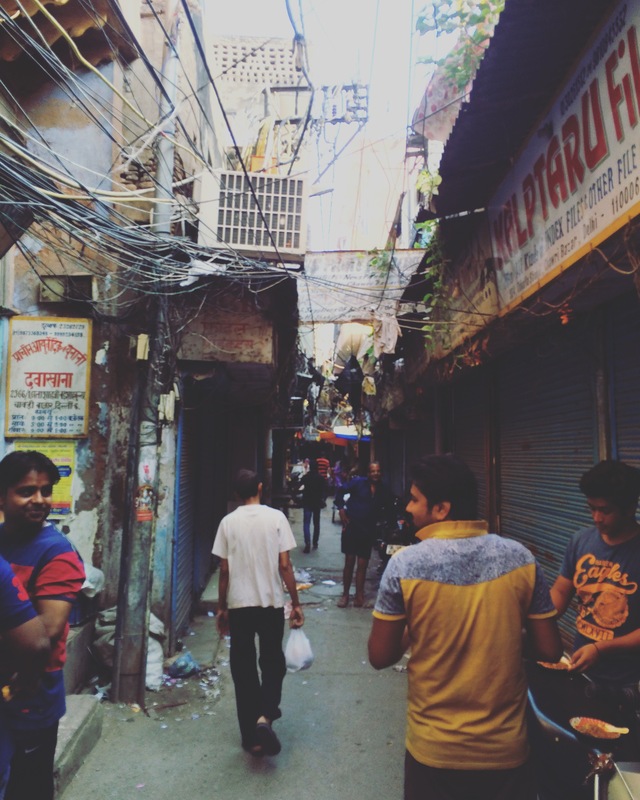 We went to the old spice market at Chandni Chowk and had a little walk around. It was absolutely hilarious as the spices caught the back of our throats and we were all coughing, each time we took a breath in the spices only got stronger and made it worse! 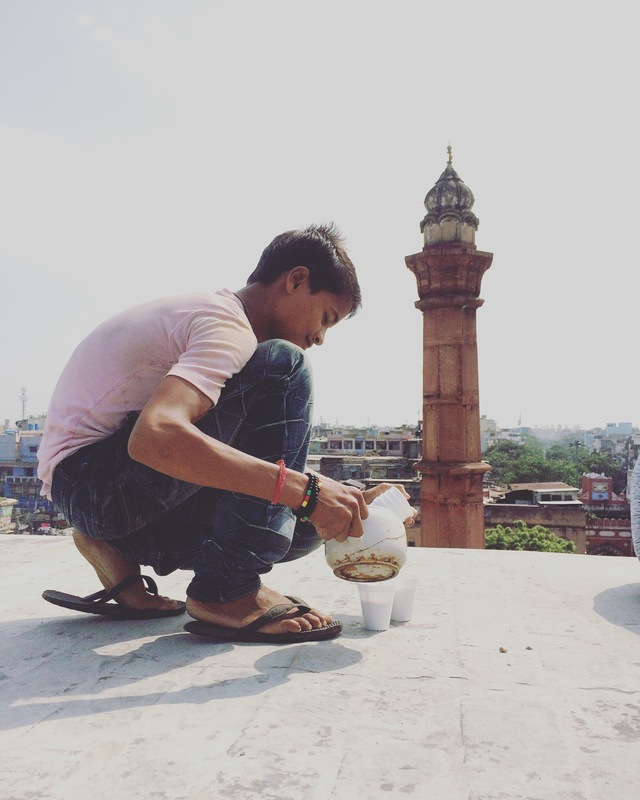 We climbed some steps out of the spice market, up about 5 floors and then all of a sudden we are on an empty rooftop, just behind Fatehpuri Mosque, with a 360 degree view of Delhi. Baddu had arranged for some tea and biscuits to be brought up for us and we enjoyed this whilst relaxing in the sunshine. Baddu decided it was time for more food and he took us to another little street food stall come restaurant called Parawthe Wali Gali. You can watch the guys cooking the bread and chapatti on the little stove just on the street. The food was pretty similar, a lot of chickpeas and lentils, but it’s just so tasty. Absolutely nothing like the Indian food we get in Scotland. 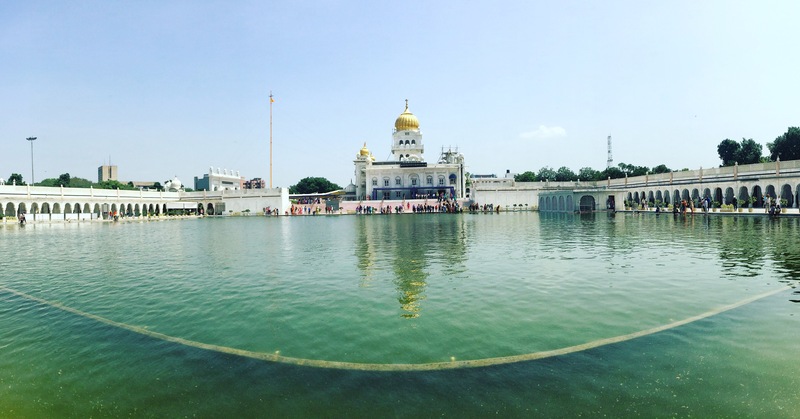 Bangla Sahib is a Sikh temple. Covering your hair, removing your shoes and leaving any tobacco behind is considered a common curtesy and so we set off in to the temple barefoot and clad with an orange bandana type thing. Inside the temple you are not allowed to take photos as there are many people praying. Three men were sitting in a group, singing into microphones which were then projected around the room. It was really quite moving and you could feel the energy in the room. This temple also provides it’s worshippers and anyone else with free food. Men and women volunteer to prepare the food, serve it and clean up afterwards. We walked through the kitchen where there were industrial sized pans and bowls filled with fresh food. The eating hall was packed with people. Begging is a big problem in India. People beg for money or food, but nobody in India could actually starve as there are places like this where free food is readily available. It is difficult to ignore the beggars and it does feel like you are being rude, but at the same time by giving them money you are only encouraging them to continue. 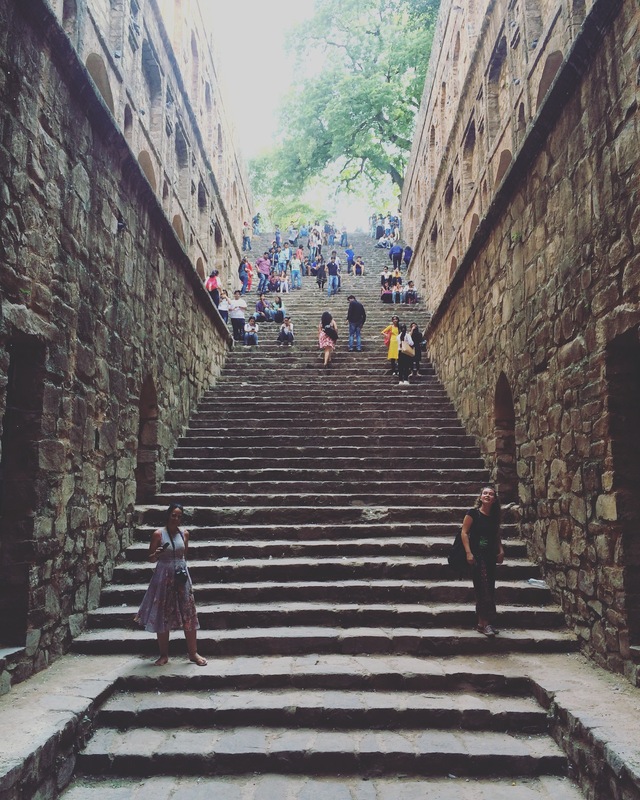 A few of the guys on the tour were into photography and so we headed to Agrasen ki Biola which Baddu thought we would find interesting. This is a step well, one side a sheer drop and the other with over 100 steps going gradually to the bottom. There isn’t much definite history about who built the well. 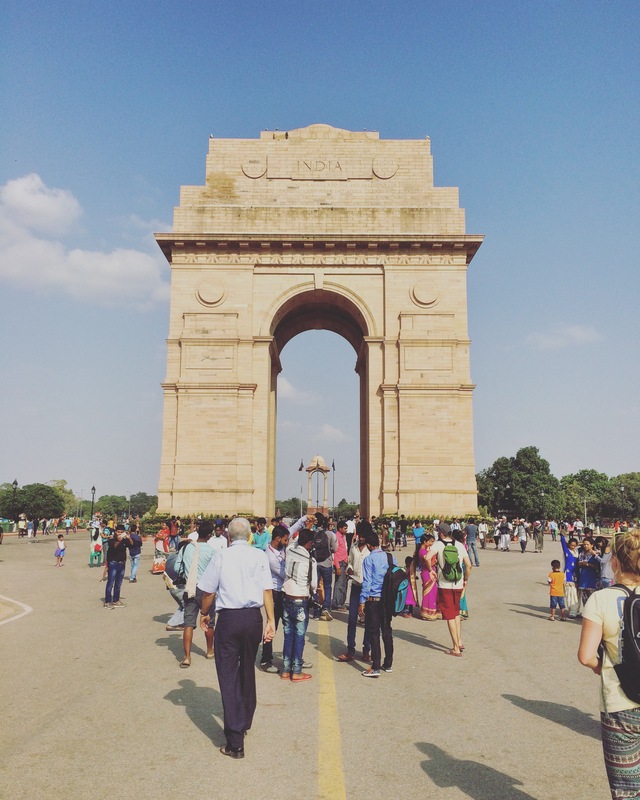 Our last stop was to India Gate, a war memorial to remember all of the Indian soldiers who lost their lives in the many wars they have been involved in. It is a magnificent monument which has been engraved with each of the soldiers names. Going away from the monument is a straight road which leads directly to President House, about 2km away. After a long day of pounding the streets in the blazing heat we decided to call it a day. Baddu is a really inspirational guy with big dreams to change the backpacking scene in India. 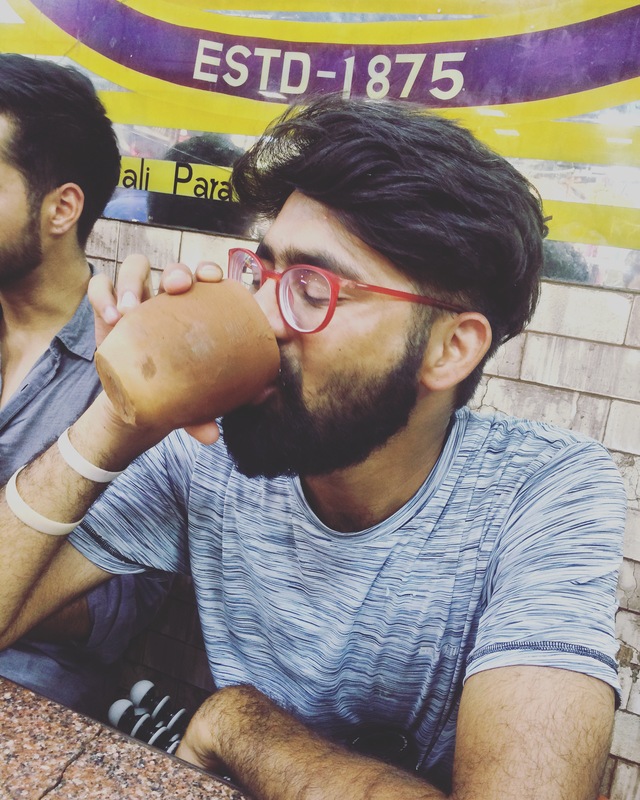 He loves everything local and tries to show you the real India, places many tourists would never be able to find without guys like him. You can get in touch with him at Madpackers, Delhi. The train from Ella to Colombo took about 9 and a half hours, but it passed pretty quickly (until a man sat next to me, fell asleep and proceeded to snore for the rest of the journey!). I arrived in Colombo station and got a ticket to Mount Lavinia. This cost me 30 rupees (approx 15p). The train was absolutely packed already. I managed to wriggle myself and my backpack into a tiny gap amongst all the business men on their way home from work. Each time we stopped more and more people squashed themselves on to the train. It was so packed I couldn’t move. Eventually my stop came and I wrestled my way off the train, glad to be out of that hot and smelly tin can. I took a tuk tuk to my new hostel, Colombo Beach Hostel. I found the reception staff not as welcoming as in the previous hostels, they didn’t seem to want to help. I was shown to my room and given linen to make my bed. The dorm is very basic but again you have everything you need. There are lockers but my padlock didn’t fit so I could not use it. The hostel has a great rooftop terrace looking over the ocean. There is also a fully equipped kitchen if you fancied making your own food. 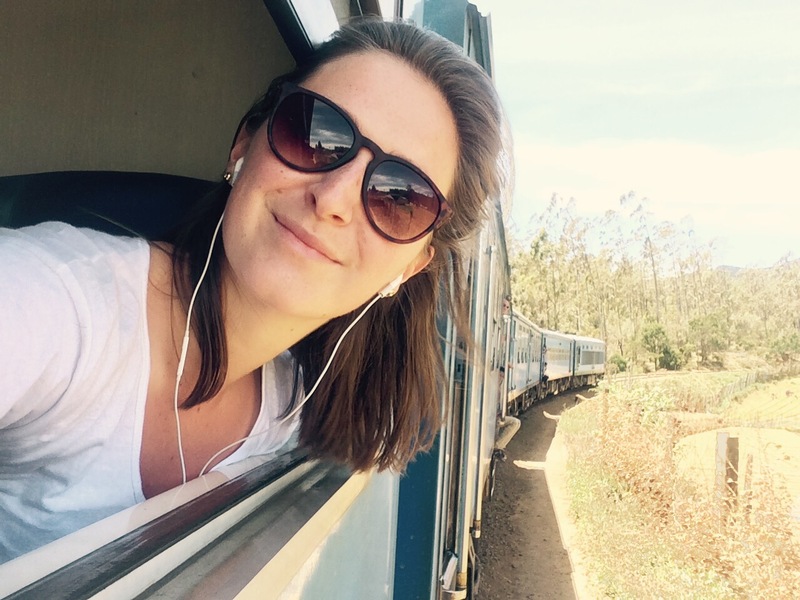 The next morning I decided to take the train down the coast to Galle. The beach at Mount Lavinia isn’t very nice at all so I was keen to see some of Sri Lanka’s nicer beaches which are famous for being so beautiful. The train cost 170 rupees (approx 80p) and took two and a half hours. The train takes you down the south west coast where a lot of damage from the tsunami on Boxing Day 2004 is still visable. I have found the locals to be very friendly and helpful. This was no exception on the train when I was sat next to a man called Nani. He gave me some good advice about what to do in Galle and which beach to go to. When the train stopped he showed me which tuk tuk drivers as the best to use (private ones can rip you off, official ones have little stickers in the top left of their windshield). 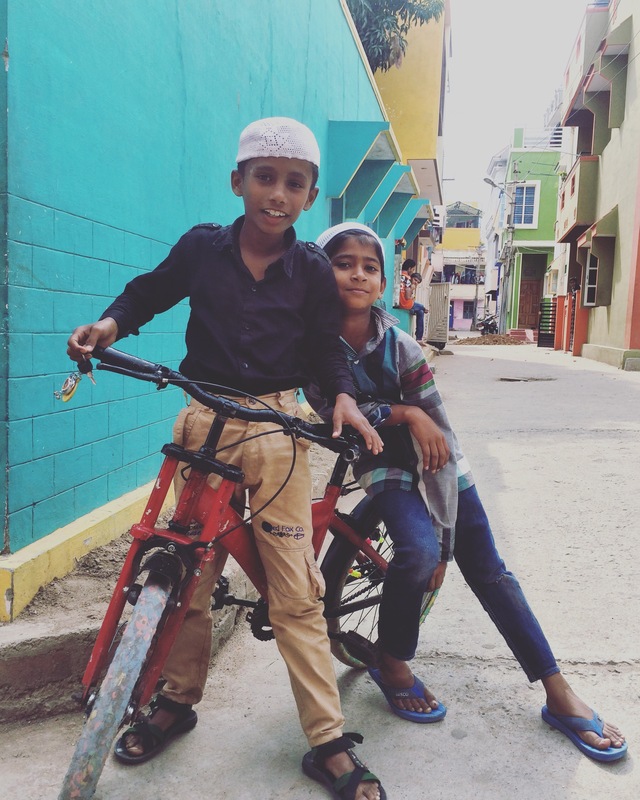 Since I only had a few hours in Galle I felt the best thing to do was to hire a tuk tuk driver and ask him to take me to each place I wanted to get to. This is a bit extravagant but definitely worth it if you are short on time. We headed out of Galle and to the Unawatuna area. The beaches there really are stunning. White sand, blue sea, palm tress and big boulders in the ocean make it very picturesque. 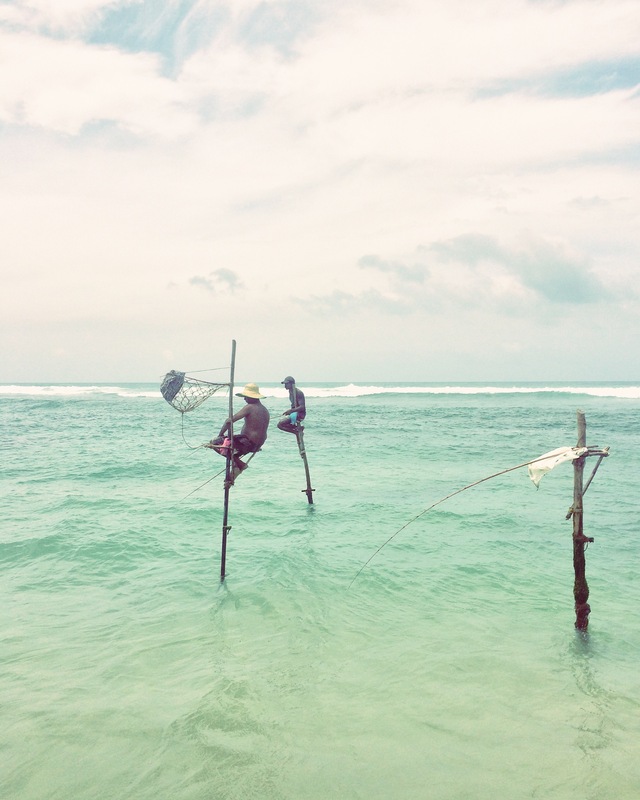 There were many spots where you could see the stilt fishermen. These guys can sit out there for up to twelve hours in a day, from sunrise to sunset. They will catch approximately 6kg of sardines which will then go straight to the market. We headed to the turtle conservation project at Koggala. These guys work to protect the 5 different species of turtle which can be found in the waters off the coast of Sri Lanka. They will walk along the beach at night to try and catch the poachers getting to the eggs. If the poachers get there first, they will go to the markets to try and buy the eggs back. Sometimes they are too late. 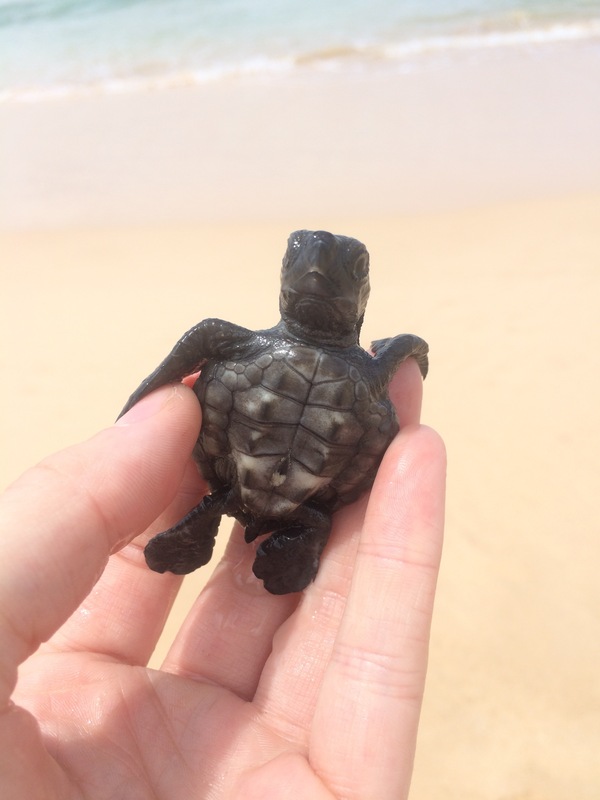 On the day I was there, there was one 9 day old loggerhead turtle which needed released. The tanks had to be empty as they were expecting the eggs they had in their protected area to hatch any day. With animal sanctuaries it’s hard to know if you are doing right or wrong by going there. But I hope my donation will go towards the care of these animals. We then headed to the herbal garden. I was shown around the garden and given an explanation about the benefits of each of the different plants. Some of them sounded really quite amazing, whether they work or not… I don’t know. The next stop was Dalawella beach. 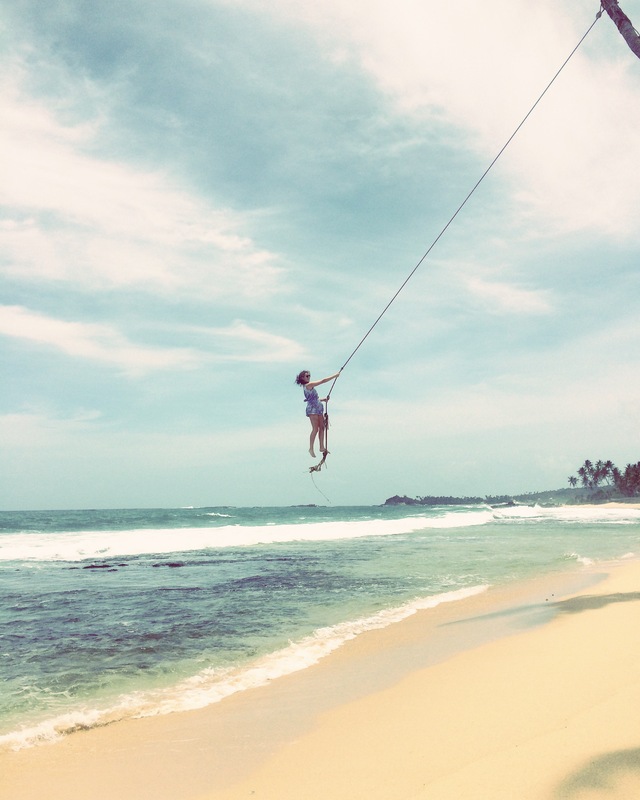 I had heard about this beach and the great rope swing which will send you flying high above the ocean. On arrival I was greeted by the lovely family who own Pearly’s Beach Cabanas (accommodation consisting of cabins right on the beach). They were so friendly and chatty. The little boy was desperate to show me how the rope swing worked. He made it look very easy! Next thing I know I’m being encouraged to climb a palm tree and have a go myself, the only words of warning being ‘don’t be afraid, you won’t hit the tree’. And off I went! It was a lot of fun and certainly gets your adrenaline going. 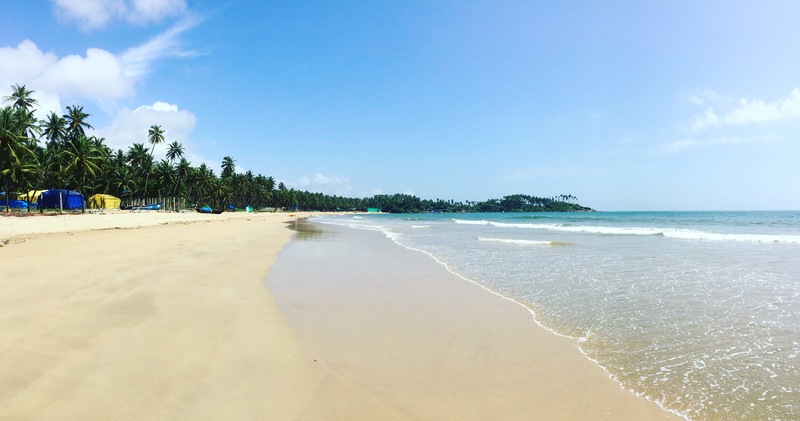 After a bit of time on the beach, we headed back in to Galle. I was dropped at the Old Fort. This is a really interesting place with a lot going on. Many shops, restaurants, cafes and, what seemed to be, a courthouse. You can walk around the Old Fort, this takes about 45 minutes. I headed out of the Old Fort and along to the Old Dutch Market. On the way there are many markets on the side of the road, mostly selling fresh fish caught that morning. The Old Dutch Market sells mostly herbs and spices. It’s a hive of activity. It’s great to see all the locals buying fresh, local produce. My time in Galle was over and I took the train back to Mount Lavinia. I sat on the rooftop and had some food with two of the girls from the dorm and a Buddhist monk who was over from India renewing his visa. He was a very interesting man with many stories to tell. 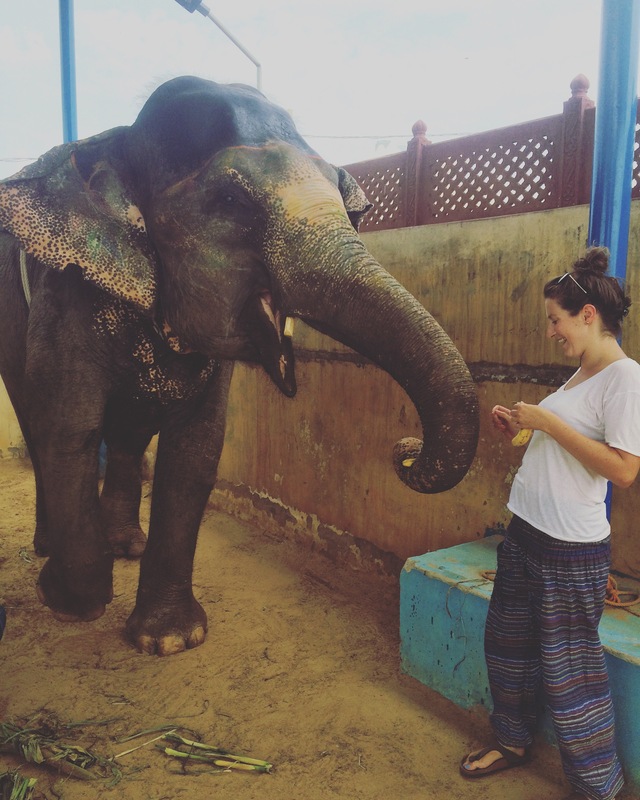 My time in Sri Lanka is over! I have seen a lot of beautiful places, a lot of dirty places, met many happy and helpful locals, and also many friendly backpackers. It’s a great little country which is thriving. Some advice for Sri Lanka- if you are going to be taking public transport, always cover up. You will attract less attention to yourself and it makes the journey much more comfortable. Even when you are walking around the streets, it is rare to see females wearing shorts or a vest top (even tourists). I wasn’t expecting this at all and was totally unprepared having only brought one pair of trousers and two tshirts. 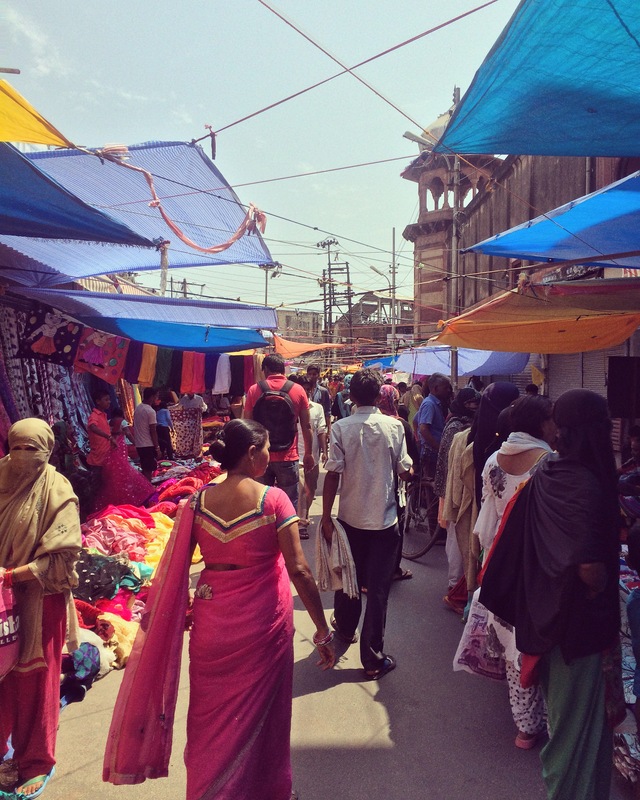 There are plenty of markets where you can pick some clothes up very cheap. To get to the airport from Mount Lavinia I took a train to Colombo which cost 15 rupees (not even 10p) and then a bus from outside the train station to the airport. I read online that the bus would take half an hour, but it was well over an hour before we were at the airport. Thankfully the bus had air con and only cost 300 rupees (approx £1.50). You can check train times online (www.eservices.railway.gov.lk), but not bus times. I think it is a case of turn up and a bus will show up at some point, and they leave when they are full. They are fairly regular on the popular routes.